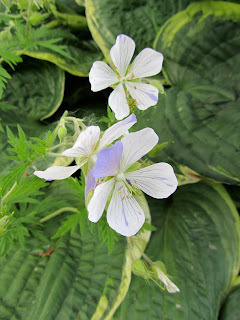 Hardy Geraniums or Cranebill, as some people call it, are a great addition to the shade garden. They come in a wide variety of colors from white, blue, pink, purple, etc. Hardy Geraniums are very easy to grow. Often if you cut them (sometimes I cut them in half) after they bloom they will bloom again later in the season. My friend, Cheryl, refers to them as the stinky plant, as some still have that smell you come to expect from annual geraniums. Some varieties are a little more vigorous, such as the Geranium macrorrhizum variety. The macrorrhizum variety tend to reseed themselves quite easily, but the majority of their roots are above of the ground so they are easy to pull. I love the Geraniums. I have just started looking for more unique ones! Thanks for the share! Can you winter over the annual geraniums in California? We have to dig them up and put them in a paper bag in the basement if we want to keep them over winter.